After an eventful weekend of weddings, we’ve finally found some time to sit down to blog about the last few weeks - with a cup of tea and slice of cake in hand of course! Special events have been aplenty this year, from wonderful weddings, to charming christenings. We’ve loved the unique style and nature of every one of events, it really has made them a delight to work at. Saturday 14th June saw us at The Barn at Chilton, for Ben and Cherise’s wedding. This fabulously organised day was planning to perfection, making our job of serving up canapés and drinks easy and enjoyable. From one wedding to another, this time with a laid back, relaxed feel on the beautiful Midsummer’s Day. We served up a late afternoon tea, at 6.30pm, and mingled amongst the bridal party and guests who got stuck in with sorting out key elements of the big day. The ultimate in vintage chic weddings took place at the end of June in Laughern Hill House. Mel and James, and their three children, were great to work with. They even hired a vintage caravan with props for photos – hired from a company called Penny Lane Vintage. Brides-to-be look them up! Celebrating a new life amongst happy friends and family is always a favourite occasion of ours, so we were delighted to get a last minute booking for a christening in mid June. Our signature afternoon tea was enjoyed within the garden, against a stunning backdrop of a beautiful Cotswolds home. Another gorgeous christening in late June followed this, where attention to detail was paramount. New mum, Debbie, opted for vintage glassware and flowers in jam jars and teapots – arranged by your truly! Fabulous local suppliers Lavender and Linen and Stephanie Saunders got involved too by providing the glassware and flowers. Of course, summer celebrations wouldn’t be complete without attendance at the odd foodie market. 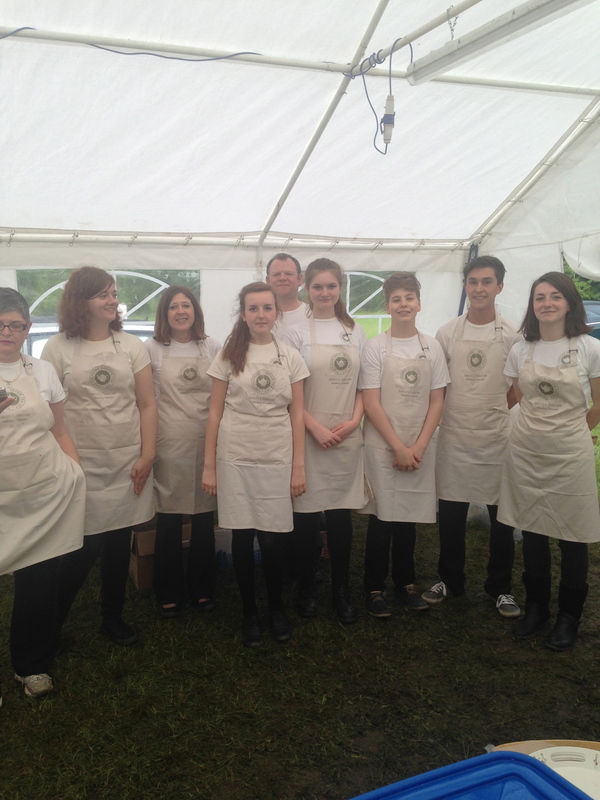 We provided the pop up tea room at The Cotswold Table, a fabulous market, held quarterly, on Kingham Green. One thing we particularly love about these events is getting the opportunity to sample some of the other delectable offerings. Some of our favourites had to be The Wild Oven- a transportable pizza oven – and Once Bitten - a company selling all sorts of scrumptiously sweet goodies such as biscotti and homemade truffles. Our tastebuds are tingling just at the thought of the foods – it’s definitely a perk of the job! Luckily over the last few months, we’ve managed to recruit some great little helpers. We’ve welcomed Liam, Tom and Rebekah to our team. They’re all teenager, but all absolutely fabulous. They bring a real sense of energy, hard work and passion to the team – which is much needed with our ever-growing calendar of events. Perhaps we’ll see you at one of them soon! 'The Team! '.....well, some of them! Here you will find our latest news, recipes and all sorts of interesting and tasty stuff!